This clock is made to order and cannot be sent on next day deliveries. Estimated delivery time is 3 - 5 working days. 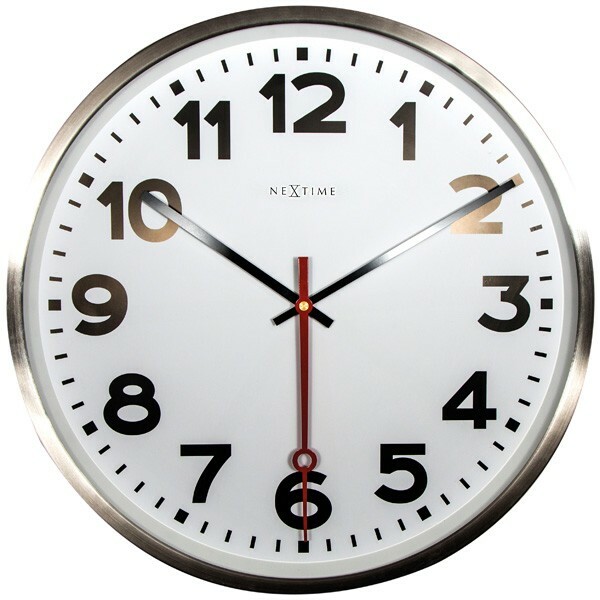 Add a stunning focal point to your home with the Nextime Super Station Clock - Number! This giant 55cm station wall clock is a traditional design with a stunning contemporary twist! With its impressive 55cm diameter, this sophisticated station clock cannot fail to be noticed by all your guests. With a sleek stainless steel case, crisp white face contrasted with bold black numbers, this simple but stylish design has been given an injection of modern colour with the red stylised sweeping second hand. Super by name, Super by nature, this extra-large wall clock would make a stunning feature piece on any wall. It also comes with numbers, and in a smaller 35cm version - see on the right hand side! I LOVE my Station Clock. It is elegant looking, well made, accurate. All visitors comment on its 'beauty', even my artist partner raves about it!